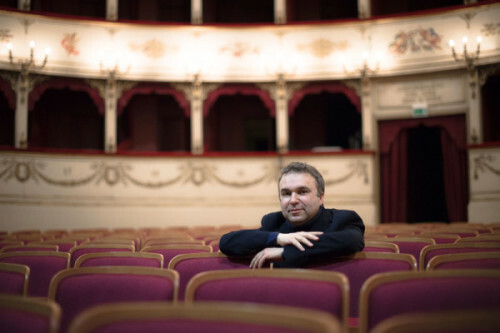 Born in 1965 in Sant’Angelo in Lizzola (PU), he studied at the Pesaro “G.Rossini” Conservatory and at the Parma “A.Boito” Conservatory getting his Diploma in Flute in 1986 with the highest marks. He plaid as Principal Flute with the Parma Orchestra Sinfonica “A.Toscanini”, I Solisti Veneti, the Bolzano “J.Haydn” Symphony Orchestra, the Orchestra Filarmonia Veneta, the Virtuosi Italiani, the Milan “G.Cantelli” Orchestra, the Orchestra della Svizzera Italiana, the Orchestra Internazionale d’Italia, the Orchestra del Teatro Regio di Parma, the Venice Orchestra del Teatro La Fenice and the Bologna Orchestra del Teatro Comunale. He performed at the main concert seasons in Italy, Spain, Portugal, England, France, Switzerland, Germany, Austria, Japan, China, South Corea, Malaysia, Thailand, Mexico and Brasil, playing with musicians such as M.W.Chung, , M. Rostropovic, V.Mullova, I.Oistrack N.Gutman, L. Kavakos, J. Rachlin, M. Vengherov D.Renzetti, S. Accardo, Lü Jia, P. Maag, O. M. Wellber, M.Turkovic, E.Morricone, G.Bertini, U.Ughi, J.Galway, J.P.Rampal, J. Grubert, R.Vlatkovic, B.Bartoletti, M.Plasson, J. J. Kantorow,L. Pavarotti, J. Carreras, L.Nucci, R.Kabaivanska, etc. He has also had a lively chamber activity, performing at Wiener Festwochen, Edinburgh Festival, Venice Biennale, Ravenna Festival, “Novecento” Festival of Teatro Massimo in Palermo, as well as at Filarmonica Romana, Nice Festival, Settimane Senesi, Montepulciano International Festival, Santiago de Compostela Festival, Oporto Festival, Brescia and Bergamo Festival, Cremona Festival Monteverdi, Cervantino Festival in Mexico, Recklinausen Festival, London-Chensea Festival, Tokyo Kyoi Hall, at the sacred enclosure of Tofokuji Temple in Kyoto. He has made several television and radio recordings for RAI, RSI (Radiotelevisione Svizzera Italiana), TVE (Spain), TF1 (France), MEDIASET, NHK (Japan), a documentary film on G.Rossini symphonies for the English BBC, a Worldwide Broadcast Concert (RAI) for the 23th International Eucharistic Congress in the presence of Pope John Paul II (Bologna 1997) and a European Broadcast Concert (RAI) with J.Carreras (Rome 1998). He recorded first absolute performances for Ricordi, Fonit Cetra and MGA-Paris, and – as soloist – the W.A.Mozart’s Concerto KV 314 and Four Quartets KV 285, 285A, 285B, 298, E.Bloch’s Modale Suite and C.Debussy’s Syrinx. As Orchestra Principal Flute he has also recorded 36 Compact Discs with works from the lyric-symphonic repertoire for recording labels Nuova Era, Dynamic and Alpha (Tokyo). He was a player, together with Maddalena Crippa and Uberbrettl Ensemble of “Schoemberg Kabarett” with director Peter Stein, a show featuring from 1998 to 2004 at leading Festivals worldwide. Always committed to teaching, he has taught Flute at the “A.Boito” Conservatory in Parma, at the “S.Giacomantonio” Conservatory in Cosenza, at the Istituto Superiore di studi Musicali “G.B.Pergolesi” in Ancona and at the Corsi Internazionali per la Formazione Orchestrale “F.Fenaroli” in Lanciano.